The nutritional value of fruit? Is eating fruit essential to human health? What is the nutritional value of fruit? This page takes a look at this broad issue and tries to apply a few answers both from the perspective of health and green living. We are always told that fruit eating is good for us. And yet some people seem to be able to get by with very little or no real fruit intake. Some people persevere with eating fruit against their instincts. And some even find that eating fruit can cause digestive upsets and tummy aches. Nevertheless, fruit does have definite nutritional value and most people will benefit from including a generous supply in their daily diet. I'm a big fan of fruit and I believe that it's an undervalued resource for most of us. Read on below for how fruit can benefit us. The nutritional value of fruit is partly owing to the supply of good vitamins and enzymes which it delivers. Obviously, different fruits vary in their specific attributes - and we'll look at some of the commoner fruits in a moment. Some studies indicate that where dietary supplements may deliver a handful of vitamins and enzymes, natural foods such as fruit can contain thousands of active, health-promoting agents! I'll talk about one of the most over-looked benefits of fruit- eating first. Fresh uncooked fruit supplies living enzymes which our systems can use to great advantage. For example, many fruits supply "superoxide dismutase" - otherwise attractively named "SOD" for short. This enzyme has a role in protecting us against ageing. It is present in virtually all raw foods and it has a protective role against free-radicals and other damaging rogue molecules. It acts as an anti-oxidant. SOD also has a role in protecting the joints and the cardio-vascular system and respiratory system from age-related damage. Some scientists maintain that SOD is largely broken down by the digestive juices. Further, if we are healthy, we produce our own SOD. While this may well be true, SOD in foods can be assimilated to some extent and this process is helped by a natural nutrient found in wheat - gliadin. (So once again natural muesli with fresh fruit scores well as a health food!) You can even buy a supplement based on cantaloupe and gliadin - it's called "Glisodin". One type of SOD has an effect upon the mitochondria in our body cells. These little majiggers are responsible for generating energy for us to use. I know from first hand experience that when I include lots of fresh raw foods, including fruit in my diet I feel much lighter and more energetic. This effect of SOD is doubtless partly responsible for this. Fruit is an excellent source of natural fibre. 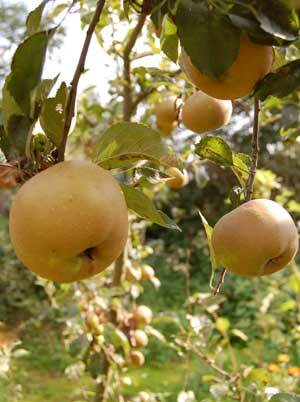 The main source of fibre present in fruit is not actually fibrous, in the simple sense of the word. If you eat apple cores and pear hearts you will get some actual noticeable fibre but most of what we call nutritional fibre is found in the soft pulpy parts of fruit too. There are the two main types of fibre found in fruits: soluble and insoluble fibre. Fibre is basically one form or another of carbohydrate. The indigestible plant fibres such as bran and cellulose (the noticeable, chewy kind) are called "insoluble fibre". Soluble fibre - which is far less noticeable when you eat it - consists of matter such as gums and pectins found inside the cells of plants. Fruit is a particularly good source of soluble fibre. Soluble fibre has an important role in reducing cholesterol in the body. One of the benefits of high fibre foods is that they make you feel full and keep you feeling satisfied for a good while. While too many watery fruits alone will not fill you up, a good balance of fruits with other foods can provide a sustaining and nourishing source of energy. Both types of fibre are beneficial. Good sources of dietary fibre include blackberries (around 7 grams per serving), apples (4 grams) and avocado (10 grams). Most fruit will supply a useful amount. An important nutritional value of fruit is its ability to supply both types of fibre. The commonest vitamin in fruit is vitamin C and this happens to be a particularly important vitamin because our bodies neither store nor manufacture it. It is also the vitamin which would have been plentifully supplied in primitive or "Stone Age" diets but which is woefully under supplied in the modern fast food diet. Vitamin C protects against heart disease and the "free radicals" which play a part in ageing and cancer. The best fruits for Vitamin C are the citrus group - oranges, lemons, grapefruit and tangerines to name a few. Other excellent sources include kiwi fruit, mangoes and papayas and many of the soft fruits such as blackcurrants and strawberries. Vitamin A is another important vitamin for the immune system and for good vision and bone growth. It also helps regulate some hormones and promotes healthy teeth and hair. In fruit it generally turns up as beta carotene, which the body then uses to make vitamin A. Fruits of a deep yellow or orange colour are usually good sources of beta carotene. Vitamin A is also important for protecting our eyes from damaging ultraviolet rays. A related vitamin is lycopene which is found in red coloured fruits such as tomatoes, guava, watermelon, pink grapefruit and chillies. Lycopene has an important role in protecting us against cancers and heart disease. It is a powerful anti-oxidant. Some fruits also contain useful amounts of some of the B vitamins and some vitamin D and E. However, most of these nutrients are better supplied in other foods. Check the pages on whole grains and nuts for more information. Another nutritional value of fruit is that it is a rich source of essential minerals. Good quality fresh fruits supply minerals such as potassium and magnesium, iron and calcium. Potassium is particularly in demand for many of us because of our sodium-rich western diets. Salt (sodium) and potassium are in a balance in the body cells and, (although the body maintains that balance through thick and thin,) a chronic lack of potassium can cause a number of problems from muscle spasm and pain through to cancer and heart disease. Potassium helps the body to cleanse itself of impurities and also helps maintain a powerful energy system. One of the symptoms of potassium deficiency is chronic fatigue. Good sources of potassium include bananas, blackberries, oranges and tomatoes. Avocados are incredibly rich in both potassium and Vitamin A. Other minerals which are commonly found in fruits include calcium, magnesium and phosphorus. Phosphorus is not generally too important as it is found elsewhere in most people's diets. Even junk food is rich in phosphorus! Calcium is a very very important mineral because it is needed for healthy bone development and maintenance. It is also not especially well supplied in many people's diets. This is because although milk and cheese products are calcium rich, the absorption rate is often low from such sources. So it as well to have some decent back up. Many "primitive" people derive calcium from certain rocks and soils. We have largely lost this art so a good natural supply from food is essential. Blackberries, strawberries, oranges, kiwi fruit and tomatoes are all relatively rich in calcium. The nutritional value of fruit such as berries can be obtained by using frozen fruit as well as fresh. Magnesium is important for bones and for nerves. It also helps us to extract energy from food. It is generally well supplied in most people's diets. Fruit and wholegrains are good sources of magnesium. Iron is another essential mineral which is commonly found in fruit. Women and girls need around 15mg per day for optimum health - men and boys rather less. Strawberries, blackberries, kiwi, tomatoes, grapes and bananas are all good sources. Raisins are particularly rich but the concentrated sugars contained in them may be a problem for some people. The World Health Organisation now recommends at least five servings of fruit and veg a day per person. In fact you can easily eat far more with nothing but good results for your health. They also find that at least 1.7 million people per year die because of lack of fresh vegetables and fruit in their diet. It is important to work out what works for you but remember you will not find fruit easy to digest if you try to eat a lot of it on top of a mixture of other things. The nutritional value of fruit is best obtained by substituting it for poorer food choices. See All Types of Fruit for Good Health for more on which fruits go well together and which combine well with other foods. Recent research has shown that the nutritional value of fruit is enhanced when you eat the skin. This is because of the concentrated antioxidants which form in and near the skin as the fruit ripens. As many fruits are grown with chemicals we are often advised to discard the skin. If you eat organic you do not have to lose these valuable nutrients! The Fruit and Vegetable Stand: The Complete Guide to the Selection, Preparation and Nutrition of Fresh Produce (revised edition) A highly rated book on using fresh produce, including fruit. Vegetables, Herbs and Fruit: An Illustrated Encyclopedia This book has lots of useful information about fruit and veg including plenty of info on growing. The Fruit Hunters: A Story of Nature, Adventure, Commerce, and Obsession An amazing travelogue in search of exotic and rare fruits. A feast! Fruits And Vegetables (Rookie Read-About Health) The title says it all! A good introduction to the benefits of fruit. For more on the nutritional value of fruit and how they may be combined for best nutritional value, please see All types of fruit for healthy eating.